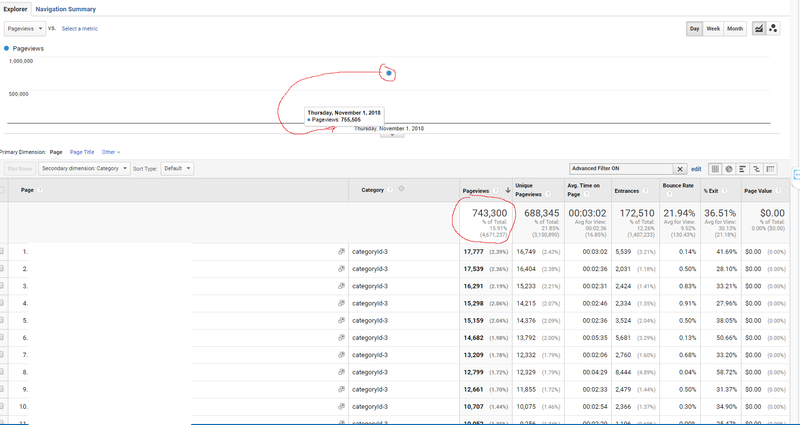 Google analytics is not displaying same numbers in the grid and in the graph with a custom dimension included. This is Behavior -> site content -> all pages report. Is this a bug, or I am doing something wrong? You are looking at sampled data. The % mentioned is about the sessions. Not the metric you currently look at. So, the sessions of your sample size did create 755.505 pageviews on 01/11/2018. That is the dot. You added a secondary dimension “Category”. Thus, the table returns the table rows containing a category in your sample. That is 743.300 results. To verify you can remove the secondary dimension and still see 755.505 pageview on the dot (you sample). Then the table total should be 755.505 too. Google Analytics “Goals” .. numbers seem inflated? Discrepancy in Google Analytics reports for Audience vs. Page vs. Content Drilldown - Why? How do I build a custom report of referral traffic for a set of domains in google analytics?